Published on Monday, August 28, 2017. This article appears in the August/September 2017 issue of American Craft Magazine. Blankets, scarves, necklaces, and earrings by B.Yellowtail artists – Sheridan MacKnight, Kendorina Redhouse, Billy Werk, Shannon White Hawk, and Yellowtail herself – modeled at the Yellowtail family ranch in Montana. 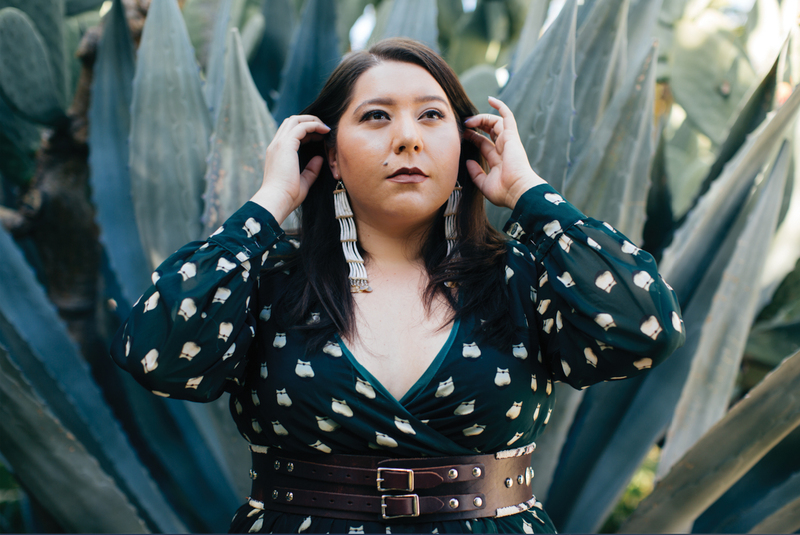 Growing up in Montana, Bethany Yellowtail never imagined that one day she’d be a fashion designer, dressing the resistance. But a few key people led her down that path. It was her high school home-ec teacher who suggested a career in fashion. “She told me I could, so I believed her,” Yellowtail says. She moved to LA about nine years ago, attended the Fashion Institute of Design & Merchandising, and landed her first corporate gig at BCBG Max Azria Group. While she learned a lot, she kept encountering the same issue: “Every time ‘Native-inspired’ or ‘Native American’ is mentioned or used in fashion, I don’t relate to any of it,” she says. “I just decided that I want to see myself in the clothing. I want to see myself as a part of mainstream fashion. So that means I have to put my own stories out there,” she says. In 2014, she launched her own brand, B.Yellowtail. The next year, she moved back to southeastern Montana for the summer and had a transformative encounter at the lone gas station in Lame Deer. A man approached her with some earrings for sale. Yellowtail loved them and asked how much they were. He said, “Oh, $15. I just need some gas money.” She didn’t have cash, she recalls ruefully, so she couldn’t buy them. But the moment provided a reality check. “I got sad,” she says, “because they were beautiful, and he just wanted $15.” She’d been in the corporate world, she’d launched her own business, and she knew: The earrings were worth eight times that much. The incident made her wonder how she could translate her experiences into opportunities for her community. In 2016, she launched B.Yellowtail Collective, an online shop featuring handmade work by more than a dozen Native American artists. While they come from different tribes and live in different states, “we all are on the same page about what we see as a bigger picture for our people,” Yellowtail says. It’s important that “people connect with the items and see that Native people are alive and here and brilliant and creative, and they can purchase their pieces,” she says. Her goal is to offer authentic Native American fashion and to share the stories of the artists who create it. And Yellowtail loves seeing artists blossom. Take Elias Jade Not Afraid. The beader (and a Crow cousin of Yellowtail) wasn’t selling his work before she approached him, but because of the exposure he’s gained through the collective, Yellowtail says, he’s now a sought-after artist with his own clientele. Keeping the website stocked is a challenge. The items move quickly, especially Yellowtail’s own line. With her business partner, Kim Meraz, Yellowtail takes care of all the photography, marketing, and shipping. She is hiring a project manager to help recruit more artists, and she plans to double the roster in the next couple of months, tapping more people from Native communities. Meanwhile, Yellowtail has become more visible herself. Approached by the Bernie Sanders campaign, she designed a Natives for Bernie T-shirt. When protesters gathered at the Standing Rock Reservation in 2016, Yellowtail created “protector gear” and raised $14,000 that went to the Sioux tribe. 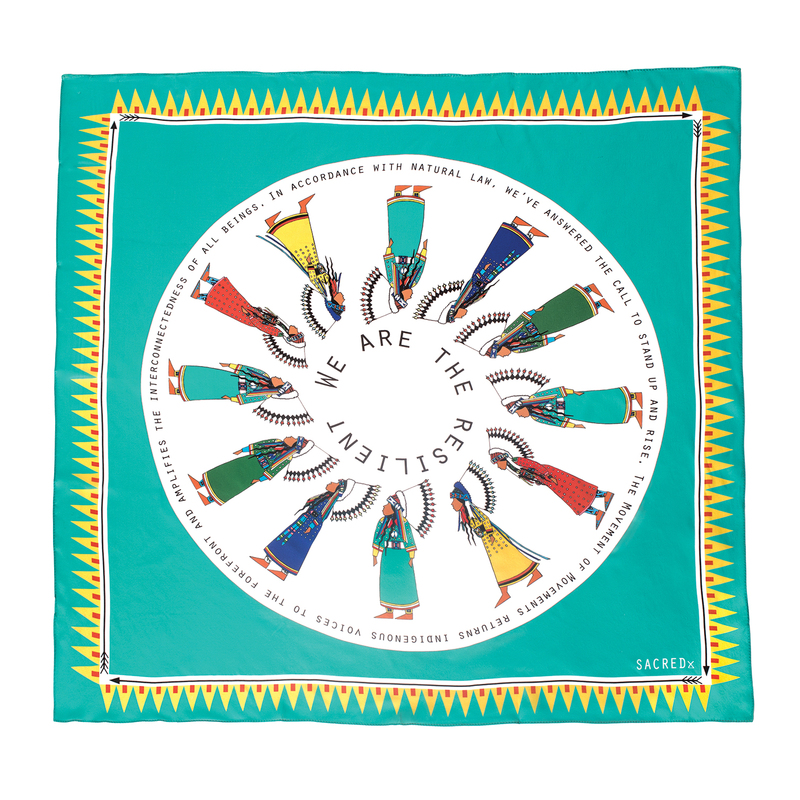 For the Indigenous Women Rise delegation at the Women’s March on Washington, Bethany Yellowtail designed this scarf depicting the ceremonial Shoshone war-bonnet dance performed by Plains tribes to recognize young leaders. Rosette Pendant by Elias Jade Not Afraid. 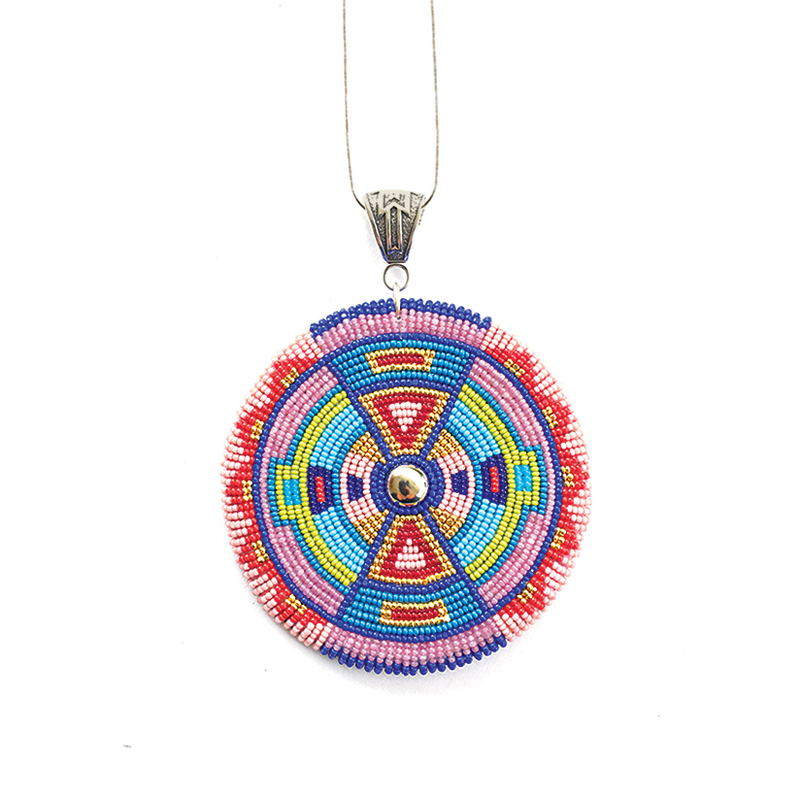 The artist learned to bead from his mother and grandfather. 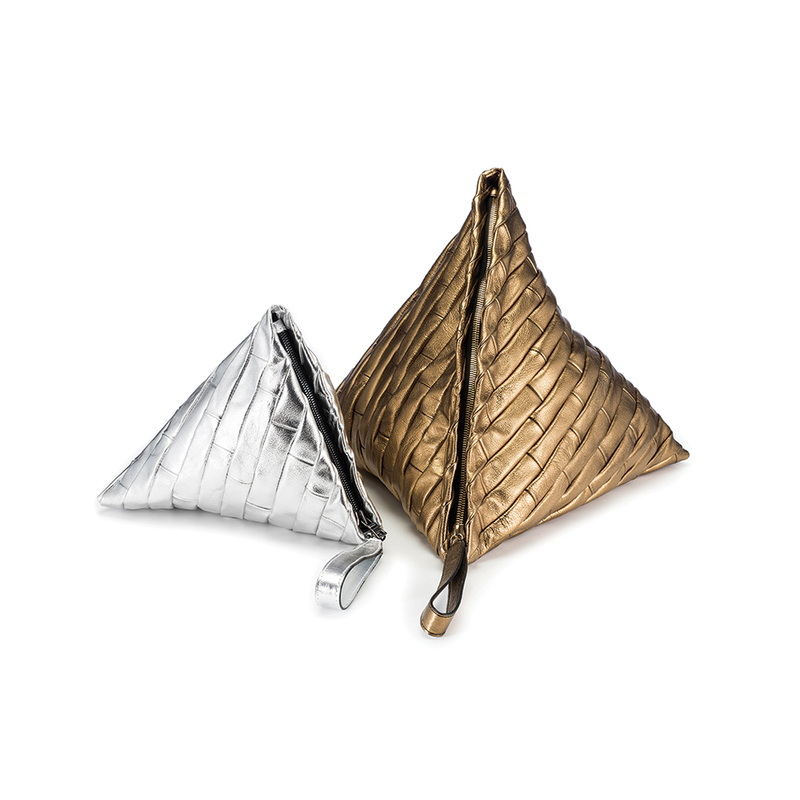 Maya Stewart’s cowhide Wristlet bags are influenced by the geometric designs of Southeastern tribes. 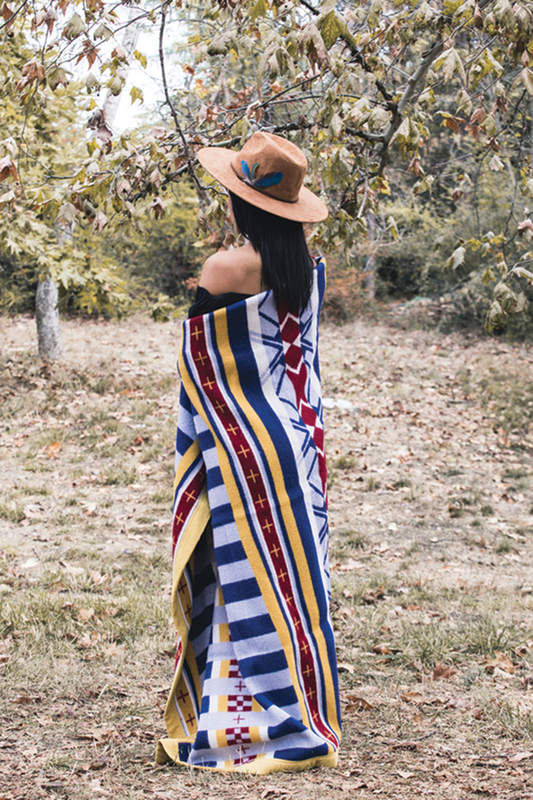 A wool blanket called All My Relations combines motifs of the Crow and Cheyenne tribes, which traditionally were rivals. 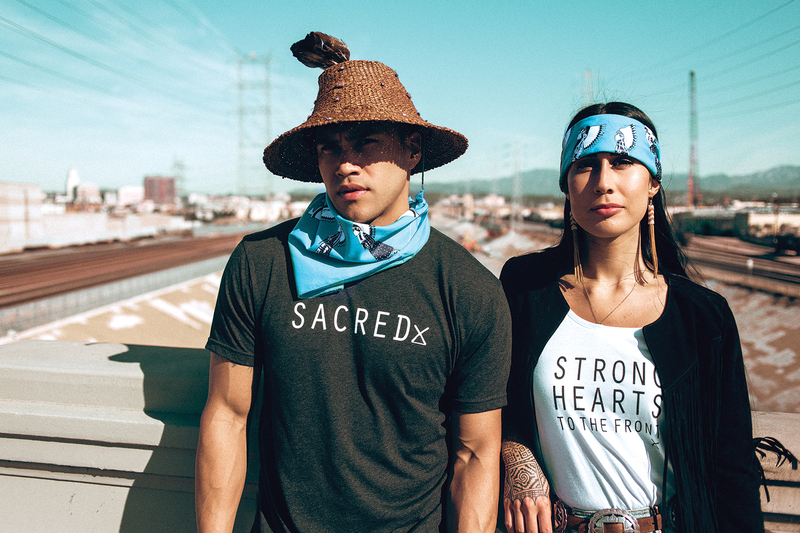 Her SACREDx line serves as a statement of indigenous rights and values. She also made “protector gear” – T-shirts, hoodies, water bottles, and the like – for protesters at Standing Rock Reservation. Yellowtail designs everything from dresses to T-shirts.